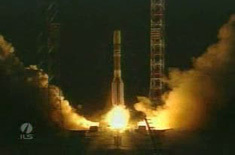 A new direct broadcasting satellite for DISH Network was launched into orbit Saturday by a Proton rocket, beginning a 15-year mission to expand the service's high definition programming across the United States. Once operational, EchoStar 14 will reach more than 14 million DISH Network subscribers across the United States, including Alaska, Hawaii and Puerto Rico. The spacecraft weighed 14,074 pounds at launch, near the peak capacity of the heavy-lift Proton rocket and the Breeze M upper stage. International Launch Services officials say upgrades by Russian rocket-builder Khrunichev have increased the Proton's lift capabilities, allowing heavier satellites like EchoStar 14 to be launched by the booster. EchoStar 14 is the heaviest commercial satellite ever launched on a Proton rocket. ILS is the U.S.-based firm responsible for selling Proton launches on the commercial marketplace. "We want the satellite to be designed to last at least 15 years," said Dean Olmstead, president of EchoStar Satellite Services of Englewood, Colo. "They have a launch vehicle that can launch a payload containing a greater fuel load that ensures that 15-year life span." The satellite will expand DISH Network's high definition television services and flexibility for the company's subscribers. EchoStar 14 will double the communications power of earlier EchoStar satellites, according to Olmstead. "The satellite can help decrease rain fade issues in certain areas of the country," Olmstead said. "DISH Network can offer local channels in standard definition and high definition. The satellite increases fleet redundancy by adding capacity to offer backup services for the other satellites." EchoStar Satellite Services manages satellite acquisition, construction, launch services, testing and operations for DISH Network. The Proton rocket and EchoStar 14 blasted off from the Baikonur Cosmodrome in Kazakhstan at 1826:57 GMT (2:26:57 p.m. EDT). 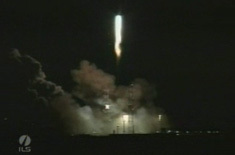 It was just after midnight at the launch site in Central Asia. 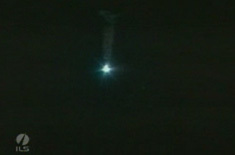 The shining silver booster rocketed into clear skies, accelerating past the speed of sound about a minute after liftoff. Two minutes into the flight, the 191-foot-tall rocket shed its six-engine first stage as the Proton's second stage engines took over. 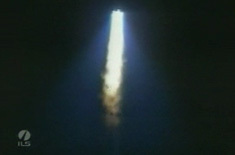 The Proton's three core stages propelled EchoStar 14 into a parabolic suborbital trajectory, and the Breeze M upper stage separated from the Proton vehicle at T+9 minutes, 42 seconds. The Breeze M ignited its main engine for nearly four-and-a-half minutes to deliver EchoStar 14 into a low-altitude parking orbit about 16 minutes after liftoff, according to ILS. 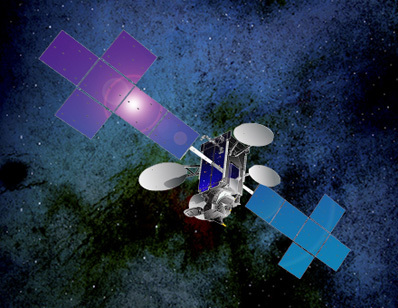 The Breeze M fired four more times to gradually push EchoStar 14 to higher altitudes. The rocket was targeting a geosynchronous transfer orbit with a high point of 22,236 miles, a low point of 1,939 miles and an inclination of 26.7 degrees. The upper stage deployed EchoStar 14 on time at about 0337 GMT Sunday (11:37 p.m. EDT Saturday) to complete the launch, according to statements by Khrunichev and ILS. "Everything occurred as planned with ignition, shutdown and separation of the Proton's first three stages," said an update on the ILS Web site. "Then the Breeze M upper stage with the satellite continued the mission, igniting five times, and then releasing the satellite into [the] transfer orbit." EchoStar 14's own propulsion system will nudge the spacecraft higher in the coming weeks, eventually reaching a circular orbit about 22,300 miles high over the equator. "On behalf of our customer, DISH Network, we are pleased with the performance of the launch vehicle and look forward to testing of the satellite," said Rohan Zaveri, vice president of space programs for EchoStar. After checks to verify the satellite is functioning properly, EchoStar 14 will enter service parked at 119 degrees west longitude. It will replace the EchoStar 7 satellite launched on an Atlas rocket in February 2002. Designed to last up to 15 years, EchoStar 14 carries 103 Ku-band transponders that will reach customers across North America. The satellite's manufacturer is Space Systems/Loral headquartered in Palo Alto, Calif. EchoStar 14 is based on the company's LS-1300 platform. "Appropriately, we're launching on the spring equinox," said Jeremy Egolf, Space System/Loral's launch vehicle mission manager for EchoStar 14. "Spring is a time of new beginnings." Another commercial Proton launch is scheduled for April 24 with the SES 1 communications satellite.